This pet food recipe has been carefully designed to give balanced nutrition to almost any creature native to the island. Includes the best protein, plant fibers to help with digestion and egg to bind the mix. Humans have difficulty digesting this. Kibble (Moschops Egg) is a Superior Kibble in ARK: Survival Evolved. The main use of this Kibble is to feed it to a creature that you are taming. Kibble has a higher taming effect than other food like Berries or Meat, meaning the taming meter will rise faster, while also dropping the Taming Effectiveness less, resulting in more extra levels when the taming process is finished. This Kibble is no longer craftable by any means on PC and Console; however, it can still be crafted in the Cooking Pot or Industrial Cooker on ARK: Survival Evolved Mobile. 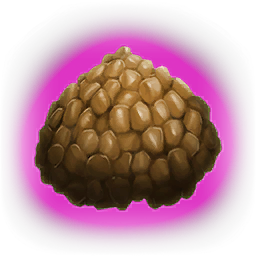 Previously, this Kibble was used to forcefully tame a Purlovia on PC and Console; however, it is still used to tame those Creatures on ARK: Survival Evolved Mobile (excluding the Creatures that are unreleased for that platform).. Currently, this Kibble is used to forcefully tame Allosaurus, Argentavis, Castoroides, Daeodon, Direbear, Direwolf, Dunkleosteus, Gasbags, Mammoth, Megalodon, Megalosaurus, Megatherium, Paraceratherium, Plesiosaur, Snow Owl, Tapejara, and Woolly Rhino on PC and Console. Simply place it in its inventory when it's unconscious and it will eat one every time its hunger drops by 53.3 units. 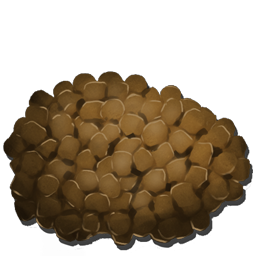 Super Kibble (Moschops Egg) is a type of Kibble exclusive to ARK: Survival Evolved Mobile. It can be crafted in a Cooking Pot or in an Industrial Cooker by substituting the normal Egg with a Super Fertilized Egg. Super Kibble (Moschops Egg) will tame a wild creature faster and with greater Taming effectiveness. This page was last edited on 10 March 2019, at 18:14.